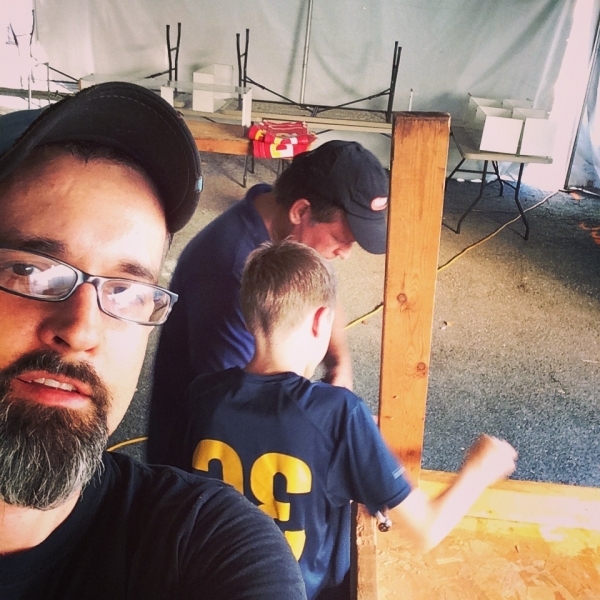 My dad showing my son how to put together tables built by my grandfather at a fair my family has been going to for the last 60 years or so. If you have known me or my family for any period of time, you know where I am right now. It was set in motion almost 60 years ago when my grandfather, my grandmother, and two friends of theirs set up a small sandwich stand at the Frederick Fair in Maryland. They were so busy that first year that they sold out, had to go around to the local grocery stores to buy more product. Then they bought out all the grocery stores’ ham and cheese and rolls. Ever since then we’ve been coming here. Of course, my annual treks to the fair didn’t start until thirty years ago, when I was eight or nine years old, but I quickly fell in love. I have deeply engraved memories of my grandfather discreetly handing me $5 bills (I couldn’t comprehend that amount, not in those days), telling me to go buy whatever I wanted. I remember going on the rides and walking through the animal barns. I remember my mom making me a bed under one of the counters while she and my dad worked late into the night. I feel asleep to the smell of fair food, the sound of footsteps scuffling just past my head on the other side of the counter, and I dreamed of the view of the fair from the top of the Ferris wheel. These days, it’s a little different. My dad and I show up before the fair begins and work for two days, setting up refrigerators and tables and meat slicers and entire systems for plumbing and electricity. Last year, my son Cade joined us for the first time, three generations together. He’s the fourth generation to work here. Our 40×40 foot tent is a quite a bit larger than the one my grandparents started with sixty years ago. The fair isn’t all fun and games anymore. Even though it’s different, there are reminders everywhere of all those years past. We still use tables built by my grandfather. We’ll stumble on old photos that never seem to get tossed, photos of me and my sisters and cousins when we were little or old co-workers being silly. We use a trailer that, for all intents and purposes, should have been retired 20 years ago. But this crazy fair is part of me, as much as Christmas or Thanksgiving or New Year’s. Every September, when the first cold day slips into the end of summer, the same thought sneaks into my mind: It’s almost time for the fair. Something else – it amazes me what an incredible impact this has had on our lives, this seemingly random thing my grandparents decided to start doing 60 years ago. It makes me open my eyes a little more. It makes me want to do extraordinary things, the kind of things that will start traditions and positively impact the lives of my children and grandchildren and great grandchildren. What can we do to plant seeds for these future generations?